It’s the tiny life for us. Yes, we’re mildly obsessed with the tiny homes that have been crafted right here in the Sunshine City. These affordable, sometimes mobile homes allow for a bit of flexibility when it comes to travel and budgeting. The second annual St. Pete Tiny Home Festival takes place at the SPC Allstate Center on March 23 and 24. 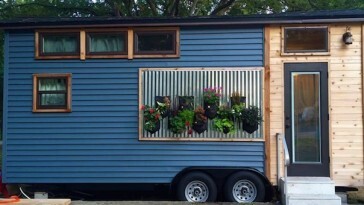 The festival will feature more than 30 new tiny homes for visitors to tour. Could you get over living in 200-500 square feet? The structures feature bedrooms, bathrooms, living areas, efficient kitchens and can easily fit in a one car garage. A tiny home can cost as little as $23,000 if you build it yourself, according Ryan Mitchell of the tinylife.com and the Tiny House Conference. The median price for a tiny home with a 3/4 bathroom, working kitchen and dining/living area is $59,884, according to research by The Spruce. The festival will feature talks from expert builders, sellers and individuals who have taken on the tiny life themselves. Tiny Home Fest takes place from 10am-6pm both March 23 and 24. Early bird tickets just went on sale and can be purchased online. Single day tickets are $10, and two day passed are $15 total. The event will also feature food trucks, local artists, and small business vendors from across Tampa Bay. The entire festival is organized by LocalShops1 and Ivy Group Consultants. Could you live in a tiny home? Let us know in the comments!